May is Asian-Pacific American Heritage Month, dedicated to the entire Asian continent and the Pacific islands of Melanesia, Micronesia and Polynesia, including the Hawaiian Islands. Let’s celebrate by learning more about the culture and cuisine of this exotic region, which puts an emphasis on freshness and blending unique tastes and flavors! The countries in this region, some remote islands, historically relied on using native ingredients because it was difficult and expensive to import outside foods. Many aspects of Asian and Pacific ethnic cuisine focus on fresh seafood, rice and local produce along with flavorful spices and sauces to liven up meals, all done to help feed the entire family and to get the most out of the products on the land. Now, places like Hawaii have recently started to reinvest in and promote their native dishes as part of a resurgence movement for traditional ethnic food. As explained in this article by Food and Nutrition, dishes like poke are influential in this movement. Poke (pronounced po-kay) is a traditional Hawaiian dish made of raw fish, sauces, and various toppings like avocado, served atop a bed of rice, noodles or salad. Recently, fast casual poke restaurants subscribing to the “Chipotle model”, where diners customize their own bowls, are starting to pop up in California. According to this article by Yahoo! News, the fresh, health-conscious trend will soon spread across the U.S.
It’s no wonder why fresh, culturally-diverse dishes like poke are suddenly on the rise. Asian and South Pacific foods touch upon many of the top trends outlined in the National Restaurant Association’s ‘What’s Hot: 2016 Culinary Forecast’, from healthier fare to fusion spices to offering fast casual and convenient options to guests. Often overlooked, however, is waste reduction and management– not only another NRA trend of the year, but also a critical factor to any eatery’s financial success. The Restaurant Group, a consulting company based in Miami, Florida, states there are two overall categories of food waste: before consumption and after consumption. Before consumption waste includes food preparation and purchasing, while after consumption includes portion sizes and packaging. All of these factors contribute to a restaurant’s profit. Fresh produce is a large contributor to food preparation waste. Sometimes, waste happens when a product passes its peak freshness before it can be sold (spoilage); in other cases, it occurs when too much of the raw product is disposed of before it arrives in its final state, like trimming the ends of green beans or coring a pineapple. By switching to a quality frozen product, restaurants can cut down on the labor involved in prepping fresh fruits and vegetables, extend the shelf life of the product, and experience 100% yield because all pieces are ready-to-use. Whether or not a restaurant operator plans to serve Asian and Pacific foods, one can take note of the key themes that surround the cuisine, including healthiness, the use of native ingredients and waste reduction. By considering using high-quality frozen produce, restaurants can contribute to their bottom line and satisfy guests’ desires for healthy, flavorful ethnic food. 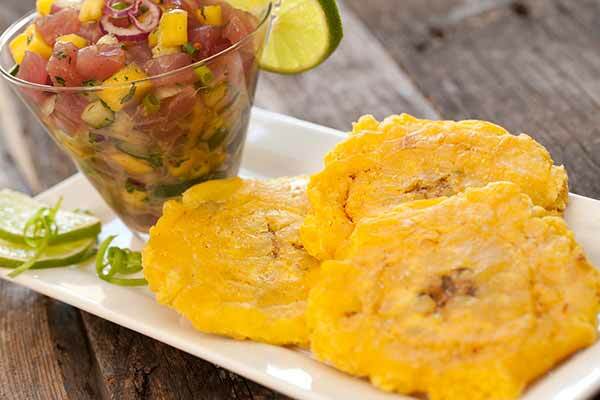 To view our featured recipe, ‘Ahi Tuna Poke with Hawaiian Tostones’, or to learn more about ready-to-use fruit and vegetable options by MIC Food, visit www.micfood.com.